In the five years since we picked up our quill and whinged away about the Jays, we've had the pleasure of second-guessing three managers. 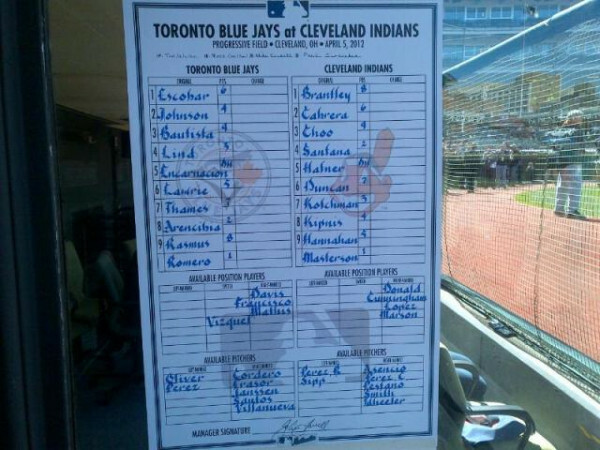 And in so doing, there is nothing that brings out the angst in us as much as their nightly lineup cards. "It's this sort of willy-nilly jerking around with the lineup that makes us wish that someone would bring back Cito." Oh my. How foolish were we? You know what they say about being careful what you wish for. By the time that The Manager returned to assume his responsibilities anew, we were stunned at the manner in which Gaston seemed to chisel his lineups into granite and steadfastly hold to them, no matter what the outcome. And as a quick aside: We still believe that lineups matter. We realize that we probably spend entirely too much time worrying about them, but the notion floated by some that you could pick names out of a hat and that it would mean little in terms of a team's offensive outcome is overly simplistic as well. (Also, we suspect that in those studies, the statistical models that were created to prove this were tailored to reach a specific conclusion.) Ultimately, we think that there is value in hitter sequencing, which is why this sort of thing still gets our goat. In many ways, we should be thankful that John Farrell splits the difference between the two approaches, adapting to the pitcher and his own personnel without making radical changes each day. We don't even mind Farrell's penchant for being somewhat strict about maintaining a righty-lefty balance. And we would be happy for such a set of circumstances were it not for that one glaring weakness that gives us a daily dose of misery: Adam Lind, batting fourth. We probably should stop harping on this, because at a certain point, it starts to feel as though we're piling on. But Lind is a lefty who cannot hit lefties, managing three singles and a walk in 22 plate appearances so far this year, and posting a .604 OPS (.263 OBP/.341 SLG) over his career against southpaws. By keeping him smack in the middle of the order, the Jays continue to leave themselves vulnerable to teams with a half-good left-handed relievers. It would be somewhat akin to having John McDonald (career OPS: .605) come in and hit for your cleanup hitter late in close games. This isn't to say that we think the Jays should send Lind packing, which is a conclusion to which we know many will jump without delay. But let's not go to that extreme quite yet. We think that Lind can be a halfway decent contributor - and far less of a pariah - in a lineup in which he slides further down. The Blue Jays might think that he still has a 30-homer bat, but we'd prefer if they let him hit those dingers out of the sixth or seventh spot in the order. At the very least, the Jays ought to try using Lind as a platoon player and see what happens. We know he can't hit against lefties, so why keep pushing it? If he can put up respectable numbers as the lefty half of a platoon, that would be awesome. And if he can't, then maybe it's time to think about sending him packing - but not until you at least try putting him in a position that (a) gives him the best chance to succeed, and (b) maximizes the team's chances of winning. But playing him every day - let alone batting him cleanup - doesn't accomplish either of those things. "We think that Lind can be a halfway decent contributor - and far less of a pariah - in a lineup in which he slides further down. The Blue Jays might think that he still has a 30-homer bat, but we'd prefer if they let him hit those dingers out of the sixth or seventh spot in the order." So rational. But yet ol' Johnny boy Farrell doing John Farrell things. Wonder what happened after Farrell announced a week ago that EE would be the cleanup hitter? that lasted 1 day. Farrell's stated reasoning for moving EE back to 5th was that batting him cleanup would force him to use back-to-back lefties somewhere in the lineup, allowing the opposing team to use a lefty specialist against TWO players instead of one. That's actually incorrect (5 RHB and 4 LHB in the lineup means you have to stack righties SOMEWHERE, so why not the middle? ), but that's what he said. Even if it was true, what's worse: the possibility of facing a situation where a lefty specialist comes in to face your back-to-back left handed batters (or, heaven forbid, you use one of the FOUR right-handed bats off your bench in response), or allowing for the aforementioned neutralization of Bautista and EE by letting teams use a lefty against Lind in big situations? It's illogical in so many levels. I missed him saying that. He couldn't have figured all that 'logic' out before he announced the seemingly permanent move? Seemingly Farrell is sticking to this 100 AB/40 game thing, which at least he isn't some normal manager miser who just keeps a guy in a line-up spot out of spite. Regardless, I think it looks poorly on his acumen, and I will continue to mock him ignoring Lind's lesser abilities to Encarnacion, and his putrid ability to hit lefties. It's moronic. I'm just sick of seeing Lind swing feably at stuff in the dirt from every Lefthander. I am in the camp that believes he has overstayed his welcome. So much so that I found myself wondering if Lyle Overbay was around. If you really look at Lind's career, 2009 was the outlier, with 2010 & 11 being more in line. Jose will not move to 1st base this year. We need his arm in RF. More likely, they will bring up Snider as the LF, move Thames to DH and EE to 1st base. Gee, who does that wonderful calligraphy on the lineup card? I have been thinking the same thing myself. Lind has said himself that he's not good out of the cleanup spot, and his numbers show it. Batting 4th, he's .241/.292/.420 career. Out of the 5 hole, he's .278/.335/.489. Much better. In 2009, his career year so far, he split time between the 3 and 5 spots, with only 4 starts at cleanup. He hit .315/.394/.548 out of the 5 hole. I like his glove at first, but maybe it's time to end the experiment at cleanup. EE is destroying everything in sight right now, and if you really, really need a lefty in cleanup the odd time, Eric Thames would certainly be worth a look.